I'd like to create something similar for a presentation that I'm working on, but I feel a bit lost when it comes to figuring out a systematic/scalable way to this. I think this gives a decent end result. But for larger diagrams, it would be an absolute nightmare to work with a code that is so messy and so heavily dependent on coordinates and tweaked parameters. 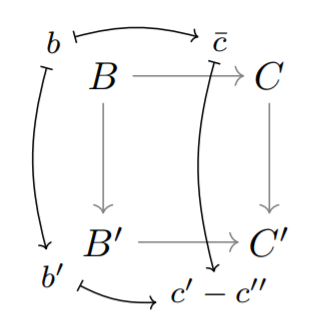 Thus, if anyone has suggestions (big or small) for a more clever way to do this (with or without TikZ) and/or a way to make my own approach a bit cleaner or more systematic somehow, that would be greatly appreciated! We clearly can't avoid difficulties and complexity when dealing with such a complicated graph when using any kinds of tool, but by using matrices it has saved a lot of work. Not the answer you're looking for? Browse other questions tagged tikz-pgf diagrams tikz-cd commutative-diagrams or ask your own question.